This year Leigh is hosting 31DOH! The Blog Hop linky party opens Oct 1st at 5 past midnight PDT and ends at 5 to midnight on Oct 31st! The love for Halloween is still alive and kicking so how about you creep out and share your obsession for all things spooky with the rest of us? by sharing your own projects or by hopping along and commenting? 🎃This is a progressive blog hop which means new projects will appear daily in the Blog Hop linky party! 🎃The hop is easy going with NO sign-up required! 🎃All art welcome, creepy and cute and all stamp companies welcome too! So....can you believe it is already October? Where has this year gone? I decided the October page would be my Day 1 of 31DOH - as usual I am going to try to post something every day. Last October I spent much of the month in Australia so I was really organised - finishing my Halloween make on the flight over!! I then only had to blog while I was away. keep watching (and commenting each day) to find out more! What did I make as my main 31DOH project last year? 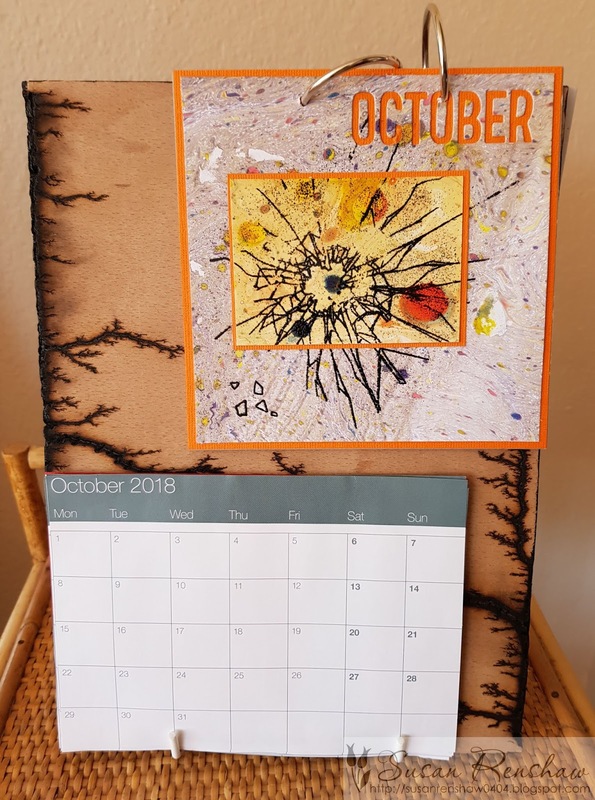 I have been making my mixed media calendar for some years now, sometimes recycling the previous year's flip card, sometimes making a new one. 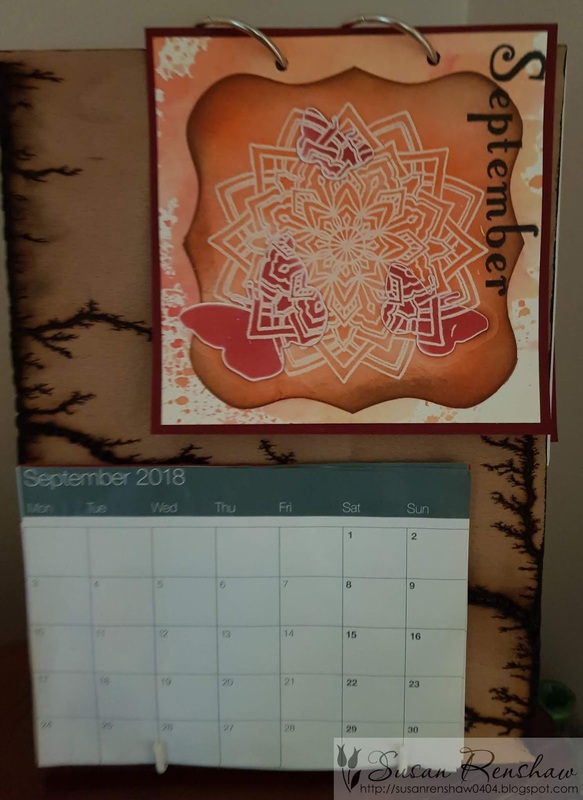 This year I decided to use some marbled backgrounds, trimming the first just smaller than the orange base. I embossed the shattered image in black embossing powder (Visible Image How Fragile) and die cut October from it (Tim Holtz die). I embossed the same image on an ATC sized piece of another marbled background and mounted this on orange too. 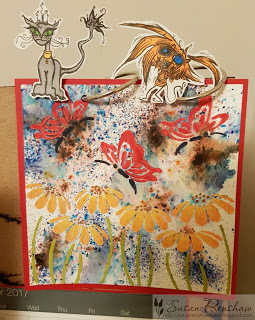 As usual you will see lots of ATCs in my 31DOH! Fabulous marbled background and embossing! I just read Mary's comment above about the spider - she's so right! lol But I have a beautiful garden spider in my craft window and love looking at her every day! No squishing allowed. Your calendar page is awesome; love that marbling. I love that you change up your calendar each year!!! Love that you are using ATCs... Happy First Day of 31 Days of Halloween! 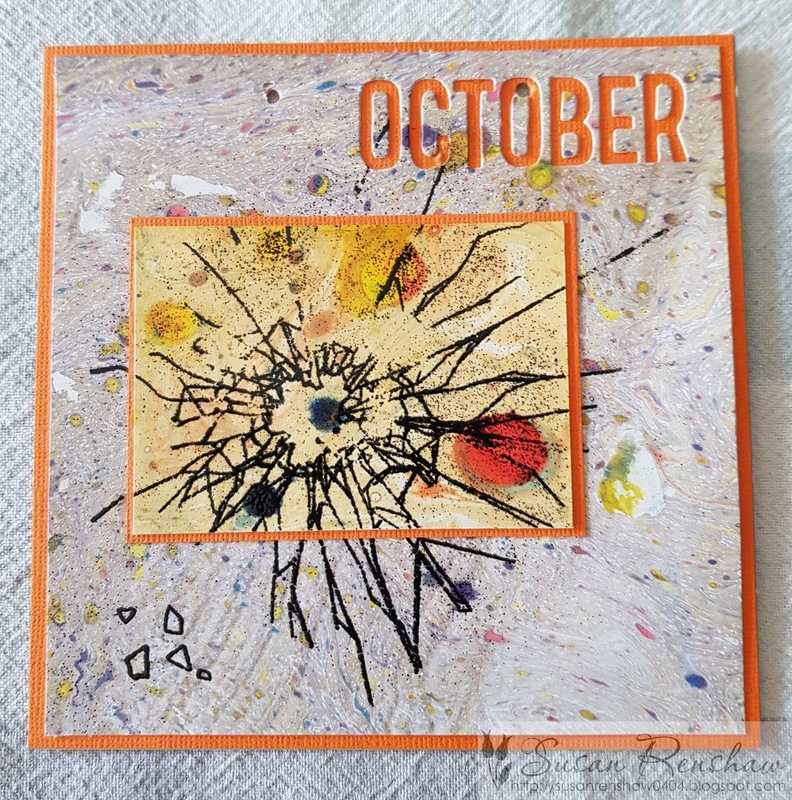 Love the marbled background and embossing- great project! 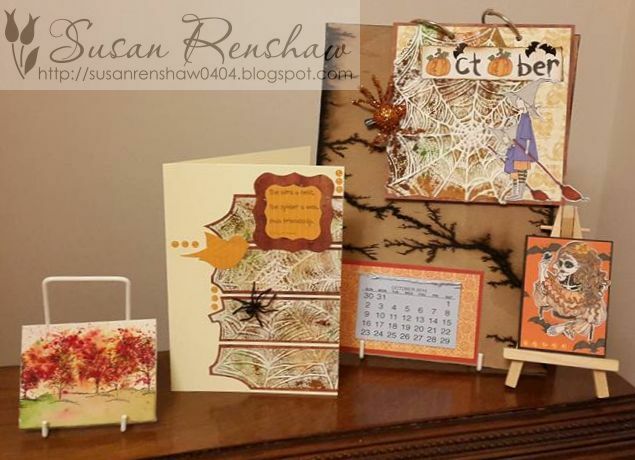 What a great idea, love the flip page - did you die cut the spiders web? Happy 1st day of Halloween, I’m delighted to have you joining in on LeighSBDesigns spooktivities this month! 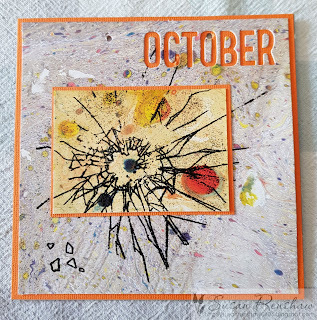 I see my comment for Oct 1st hasn't shown up so trying again...Wicked cool start to Halloween, love this calendar idea and that shattered image is awesome! Thanks for joining the Lost Coast 31 days of Halloween challenge. I like your calendar you made. Love your card - the shattered image reminds me of a spider web!! Thanks for joining the Lost Coast Design Challenge. What a great calendar page! 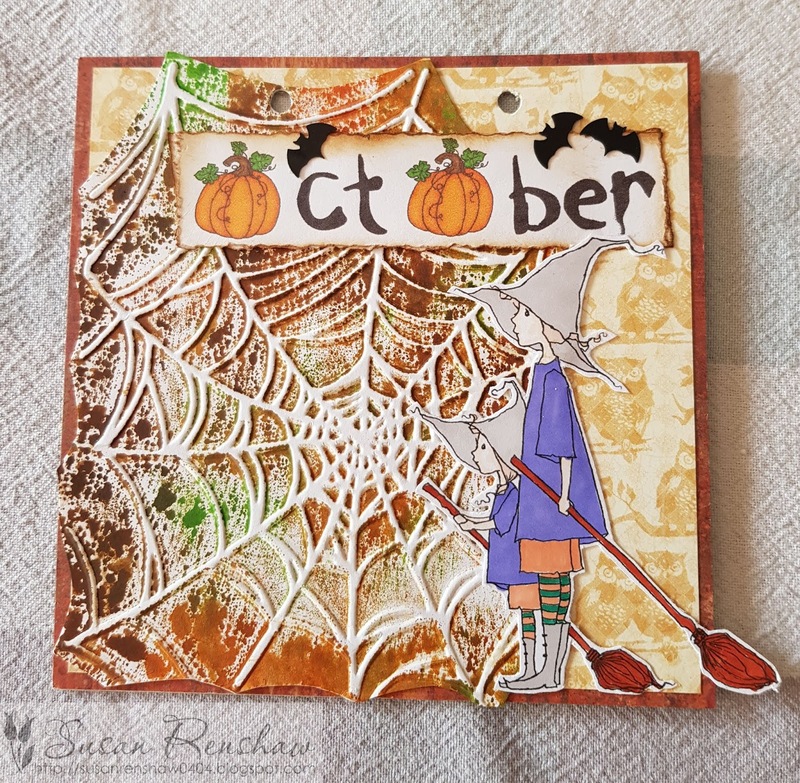 Thank you for joining in on our 31 Days of Halloween Challenge over on the Lost Coast Designs Portal to Creativity blog! 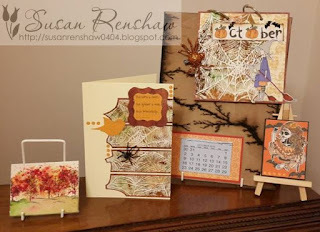 Love that flip card with the spider web! The marbling will be fun... I haven't done that in a long time. Great stuff there and love the marbling. The marble background is incredible and something I really love. 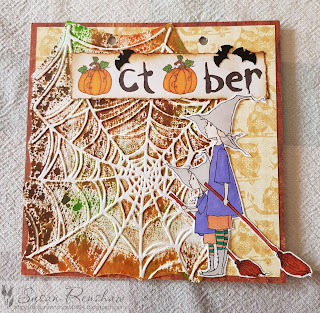 What a awesome Autumn colors with a creepy touch, love your calender for October. Thank you so much for joining Dream in Darkness, I hope to see you again in November. So awesome Susan! Love these get togethers each October! Thanks for playing with us at Dream in Darkness! New Video for Happy Little Stampers - Smile! October 11 - Day 11 of 31 Days of Halloween!